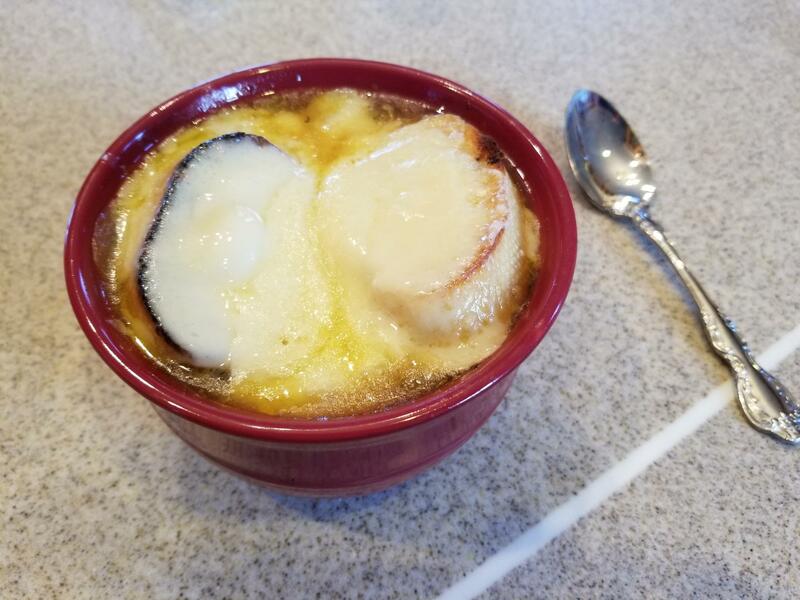 French onion soup is probably one of the first soups an aspiring chef tries to make to impress. It is seemingly simple to make, but the little twists you can include can ultimately make it one's signature soup. It brings into play one's knife skills and whether one wants to toy with the classic recipe to make it easier, faster, better, tastier, or just plain different. I'll give you my way at putting this soup together, but by all means, make the changes you want to in order to make it your own, and of course, have a glass of Chardonnay while you toil away. If you want to be more traditional, substitute with red wine and beef stock. 1. This first step is the make it or break it part of the entire recipe: carmelizing the onions. With a large fry pan over medium heat, add the butter and the olive oil. As soon as the butter melts, add the sliced onions. It is very important to keep an eye on the onions because you don't want them to burn. Stir frequently and add a little wine as needed to prevent scorching. It will take nearly 15 minutes to achieve total tenderness and a nice browning of the onions. 2. Add the garlic and thyme. Fully blend in. Add a little wine and scrape the fond from the bottom of the pan. 3. Pour in a half cup of the wine, along with the chicken stock. Raise heat to a boil and add the roux and stir. Reduce heat to a simmer for 35 to 45 minuutes; cover. 4. If you're lucky to have a thick slice toaster, cut the bread to fit into the slot and toast. If not, use your broiler to brown both sides. 5. Ladle the soup into a bowl, filling about 2/3 full to leave room for the bread slice. Float the bread and then lay 2 slices of Swiss cheese across the top, slightly larger than the bowl is fine; no need to trim. 6. Place the bowls on a cooking tray and place under the broiler to melt the cheese. 7. Remove the bowls, caution your guests that they are very hot, and enjoy with a glass of Chardonnay. Tip: For those that are unfamiliar with a julienned onion, cut off the tip of the onion, place it on the cutting board now with the rootstem facing up, and slice vertically. Remove the outer paper skin and slice off the root from both halves. Place the larger cut side face down on the board and then thinly slice it from tip end to root end.